The GoPro Hero6 Black has been finally introduced. GoPro released it on the 28th of September 2017, making it almost a year since the much awaited Hero5 came out. By the first look of the device, it looks like an identical copy of the Hero5 Black version, however there have been some upgrades in the camera’s internal specs. 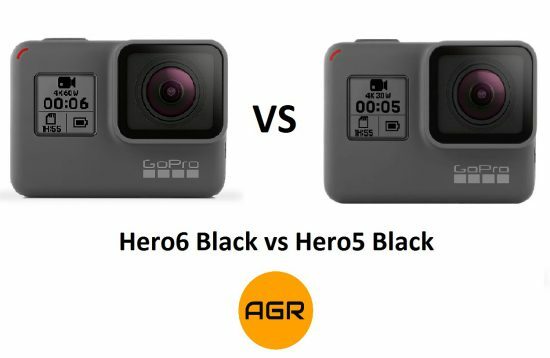 In this comprehensive comparison article, we are going to see how the latest GoPro camera goes head to head against its predecessor. The GoPro Hero6 Black design is not anything spectacular. It looks exactly like the GoPro Hero 5 Black, with the same casing, dimensions, color, button placements, ports, etc. The body size is 2.6 x 1.8 x 1.4 inches and weighs 4.2 ounces (camera + battery + memory card). To be honest, this not something which is particularly bad. Given the success of the Hero5, the manufacturer wanted to keep the same design which saw immense popularity amongst its fans. However, nevertheless, there have been some very slight updates to the design such as a directional guide on the lock lever and the display menu’s user interface. Besides the fan’s support for the current design, GoPro also has a solid reason to stick with it as the case can also act as a housing and protect the camera underwater for up to 33 feet, without requiring any separate waterproof housing. However, as was the case with the Hero 5, the Hero 6 does not support a mounting system. This can be a bummer, but you can still mount your camera by attaching a mountable frame on it. The frame comes in the box so you are not required to make an additional purchase. The Hero6 case supports additional add-ons, like a Super Suit housing, in case you want more versatility from your camera. It is also compatible with the Karma drone and Karma grip gimbal, much like the Hero5 case was. The video, photo and audio quality in the Hero6 has improved or is similar to the Hero5 specifications. The video and photo shooting quality is better due to the new processor introduced by GoPro. The GP1 processor is built in-house and has made shooting and processing footage much faster. The Hero5 and the Hero6 both have an in-camera stabilization system, which looks pretty much the same as far as the internal specifications go, however, the Hero6 has a much better stability with half the crop of the Hero5. Both the Hero5 and the Hero6 have the standard wide field of view and again you would not notice much difference in the vision while taking the camera in the real world. There are also Linear and Superview field of views in the Hero6, which have been directly imported from the Hero5. The new zoom feature (discussed below) means that the Narrow and the Medium field of views have been rendered useless. The video codec for both the Hero5 and the Hero6 is MP4. However, the codec settings internally are not exactly the same. The Hero6 comes with the h.265 codec which is the latest codec in the MP4 file format and is better in compression quality, speed of compression and playback, compared to the previous edition of the MP4. Dynamic range has also improved, this means that moving in and out of shadows is faster and more accurate than the Hero5. Shutter speed is reduced which means that capturing still shots from slow motion videos is much easier and better, less blur and more clarity. The other video codec option is the AVC and it has been retained exactly like it was in the Hero5 camera. Apart from this, the Hero6 also features more manual features for a better and controlled video shooting through new white balance, shutter speed and ISO options. The ISO has been extended to 3200. Previously, it was up to a maximum of 1600 in the Hero5, so this is a big jump in the camera. Also, you can now set the ISO manually while the shutter speed will adjust automatically unlike the Hero5 where we needed to adjust the shutter speed manually as well. This will eliminate the need of a filter in some cases. For underwater photography, you won’t need filters anymore since the Hero6 adjusts the colors when in water. What about the photo quality? Taking photos from the GoPro Hero6 is still not as good as you would expect and the problems with the grain, color quality and detailing remain persistent from the Hero5 model. Nevertheless, the Hero6’s 12 MP camera sensor allow you to take photos quickly than before and capture moments in a blink of an eye. The 3 mm lens being used in the Hero6 is the same as the Hero5, which means that you are going to see the distinct fisheye view in your photos. In full format, the lens is considered as 15 – 35 mm, making it quite sufficient for the photo shooting needs. The photos are stored as RAW or JPG, as was the case in the Hero5. Of course, the RAW allows you edit the photos later on, but if you want to use special features like burst mode or HDR, you have to stick to the JPG format only. Low-light video and photo shooting is much better with the Hero6 than the Hero5, with the pictures being noticeably brighter, sharper and colorful. Again, this is due to the processor which allows the camera to better analyze the object and optimize the image, keeping a handful of factors in mind. As mentioned above, the Hero6 comes with HDR feature which was introduced in the Hero5. However, this feature was previously called WDR in the Hero5 and had some limitations which have been reduced by the company. With the HDR feature, you can now shoot more intense and detailed shots, with high saturation and highlights. Of course, there are some instances where the saturation level was a bit more than what would please to the eye. However, compared to the WDR results in the Hero5, the new HDR is pretty good and would suffice for now. Other features that were popular in the Hero5 and are also present in the Hero6 include Burst Mode, Timelapse Video, Timelapse Photo, Night Lapse photo, etc. Do note that there is a new Auto Burst mode in the Hero6 which allows it to take up to 30 pictures in 1 second. The voice / audio has also improved. While both the Hero5 and the Hero6 offer voice control for the camera using the same set of instructions, the voice recognition has improved in the Hero6. You can now turn on the camera and start recording using voice control, a feature that didn’t exist on the Hero5. Moreover, the audio quality is a lot clearer than the Hero5, so much so that you can easily distinguish the models of the camera by just listening to the recorded footage. Both the older and newer models have Protune option, which will allow you create high quality WAV files and reduce wind noise. You can always use an external microphone if you’re looking for a crispier and clearer sound. The Hero6 comes with an all new 4K60 video resolution as well as a 1080p240 mode. What this means is that with this camera you are going to get a faster frame for your recording compared to the Hero5 camera, which supports the 4K30 and 1080p120 resolution. However, apart from these two new additions, the rest of the video recording features are almost exactly the same as the Hero5. The older resolutions also have seen some changes, with some being dropped and others being added. The 480p or 960p, which were a common feature of the previous Hero series, have now been dropped and the lowest video mode is now 720p60. This can be a problem if you are looking to capture casual footage and would always have to keep a larger space in the memory. The 4K resolution has an output of 4000×3000. This makes it the largest output on a GoPro camera, with the previous being 3840 x 2160 output. There are minor changes in the UI which can only be realized upon getting deep into the UI options. Connectivity wise, the Hero6 supports Remo and Smart Remote, which allows you to use it without being in contact with the device. The GoPro mobile app also allows you to control the camera while it is away from you. There is a USB C connector and a micro HDMI socket for charging, data transfer or to be used as a webcam or CCTV cam. Both of these features are present in the Hero5 and the Hero6. The LCD screen on the back of the Hero6 is exactly of the same size and resolution as in the Hero5 but it’s more responsive in the Hero6. The screen is just a bit brighter and has warmer colors, compared to the older version which has more blues than yellows on its display. WiFi is also much faster in the 6, so less latency when connected to the app and more speed. Check this guide if you need to reset your WiFi password. Perhaps the most important upgrade in the control is the ability to zoom into the footage. While the zoom feature is still not present for 4K recording, it is still a major upgrade and one of the most demanded features in all the previous GoPro generations. Zoom replaced the linear and narrow FOV, I didn’t really like it personally but other people might find it useful. I wrote a detailed article on how to use the zoom on a Hero6 as well as the differences between Hero5 FOV and Hero6 Zoom. GoPro Hero6 has also seen a major upgrade in its content sharing. With the QuikStory platform embedded in the device, you can now seamless share your videos and photos with your friends and family, all in a few minutes (depending on your internet). This has been made possible due to the new 5 Ghz WiFi system used by the company for the first time. The QuikStory quickly makes a video from your footage (like a collage) and allows you to share it without the pain of editing or transferring files through multiple hardware. One of the features which actually disappointed the fans and the critics during the GoPro Hero6 announcement was the lack of upgrade in battery life. This is unfortunate as the current 1220 mAh battery allows you to record up to only 2 hours of shooting. This is also dependent upon various factors such as the features you have selected while recording. For example, while doing high intensity 4K shooting, you should expect a battery support for only 1 – 1.5 hours. Due to the small size of the battery, you may want to carry spares with you. This may be good news to previous owners of the Hero5 camera as they can use its battery as a spare when upgrading to the Hero6 model. Another way to extend your battery life is by following some of my tips or using the battery BacPac from Decade, it’s really awesome and fits the Hero5 or 6 perfectly, it even comes with a waterproof case for underwater use. It lasts more than 2.5 hours so combined with your GoPro battery, you can get up to 4-5 hours of battery life. Given that the Hero6 is the new flagship camera for GoPro, it is no surprise that it takes the lead against the Hero5 in terms of pricing. The Hero6 is set to cost $499 dollars in the United States, with slight cost differences in other regions of the world. Meanwhile, the Hero5 has seen a drop in its price and has been on sale for $399, making it a great alternative for the budget buyers. Final Verdict – is it worth upgrading? The Hero6 features a completely new processor which is certainly much appreciated. However, the other upgrades are only subtle and not anything which will change the footage quality or shooting convenience dramatically. So this leads us to a major question: Is it worth upgrading to the Hero6? To be frank, unless you are a professional or an enthusiast with a thirst of having the latest gadgets, the purchase of the new Hero6 is unnecessary. The Hero6 is able to shoot in the highest resolution and has a great slow mo system. Personally, we are excited about the zoom in feature and the QuikStories. However, besides these, the Hero5 has almost all the features of the Hero6, with the most used features being almost the same. So if you already have a Hero5, there is little reason to upgrade. On top of the features, the Hero6 commands an extra $100, which is a large increase in price if you are just a casual user. Hi. I enjoyed reading your easy to understand tips on how to use the GoPro as a webcam, which I will come in handy when I need it for indoor broadcasting. My question is, is there any way possible to stream live footage, while riding a motorcycle, to another location or the web? Hi James, happy you liked the tutorial! That’s the best way to capture HD videos in real time and without latency. If you only like to stream without caring about quality and recording your videos then you might want to check my article on how to stream from GoPro to a phone. I provided a couple of ideas you can try, hope that helps! Stabilization is significantly improved with half (5%) the crop of the Hero5 (10%). Dynamic range is much better with the camera adjusting to moving in and out of shadows much faster and accurately than with the Hero5. This is an extremely important feature of an action camera. Rolling shutter has been reduced significantly with more frames captured with less blur. Not only does it look better, but slow motion and the ability to grab frame stills is much better. 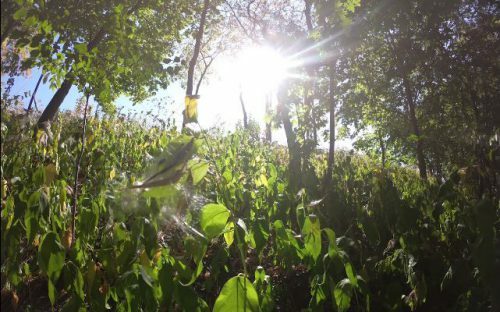 While the GoPro color contains a saturation level some might not like, both the GoPro color and Flat profile give more uniform colors and avoid washed out blue skies, especially around the sun which is better defined with the Hero6. Zoom replaces the Medium and Narrow fov. Not only are you able to Zoom to these same sensor crop fov, you can now adjust to a sweet spot between them. Additionally, you can “zoom” with linear. While both Medium and Narrow had less curvature than wide, zooming while the camera is in linear mode gives a much more natural looking image. ISO Limit can now be set to 100 while keeping the shutter speed on auto. On the Hero5 the shutter needed to be manually set and usually required filters in bright light. The Hero6 allows you to set the ISO and the camera adjust the shutter accordingly, eliminating the need for the filter. Speaking of filters, the Hero6 adjust the color profile when in water so dive filters aren’t required to get natural colors under water. The touch screen LCD is more responsive on the Hero6. Wi-Fi transfers are more than twice as fast. Ambient noise is filtered better so audio is cleared, although boosting the db in post editing is needed for good volume. Utilizing the Protune audio works better and gives much better audio without needing to boost in post. You can now turn the camera on and start recording with voice activation on the Hero6. This feature is not available on the Hero5 unless you have the REMO remote. While the Hero6 does have better low light, the user needs to make the correct adjustments. GoPro color can give a lot of noise, especially if there are vibrant colors or bright blue. It’s best to set the fps to 24 or 30 and use the flat color profile. Also, setting the WB manually or on Native will look best. The Hero6 is a big improvement over the Hero5. Be sure to use a quality microSD card like Lexar 1000x or Samsung Pro/Pro+/Pro Select as most issues reported with action cameras like GoPro are SD card related. 64GB is big enough storage. The camera’s battery will die long before you can fill it. Don’t store media on the card and format in a computer and the camera periodically. Wow that’s some amazing details on the new Hero6 features. Thanks for taking the time to write it. I definitely agree on most of the points you mentioned, especially the enhanced stabilization, WiFi and audio. However, I didn’t find the new zoom function to be very useful but it’s something and might get better in future models. I have noticed the enhanced dynamic range (HDR) in the photos and also the rolling shutter, easier capture of slow motion frames. The Hero6 is definitely the best GoPro till date.